Millions of New Yorkers are in danger because Global Warming is going to lead to an increase in the numbers and mobility of the city’s sewer alligator population, the Intergovernmental Panel on Climate Change (IPCC) has announced in its latest assessment report. According to the IPCC the warmer water and rising sewer levels caused by Global Warming mean that the alligators will breed more and be more like to move out of the sewer system – posing a major health risk to New Yorkers. The rising number of alligators and their propensity to leave the sewer system will be particularly dangerous to minorities and the children of minorities whose home tend to be near entrances and exits to New York’s sewer system, the IPCC added. The imminent danger to so many New York children is revealed in the latest IPCC report which looks at the increasing dangers of Global Warming. The IPCC says scientists investigated the threat after it was highlighted by the World Wildlife Fund (WWF), an environmental organization, in a recent report. The WWF first started looking at the issue when a senior researcher at organisation heard about the presence of the alligators in the sewer system from a colleague during a meeting. On investigation the researcher found that a number of WWF colleagues were aware of the existence of the alligators because many of them had heard that friends of their friends had had close encounters with the reptiles, narrowly escaping injury. 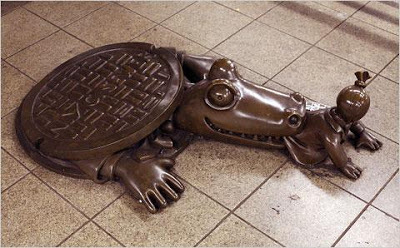 Stories and sightings of alligators in the New York Sewer system first started to emerge at the turn of the last century as it is believed that tourists returning to the city from newly fashionable Florida brought with them the latest must have accessory – pet baby alligators. However as the cute baby alligators grew into adults they often became too much to handle in cramped New York apartments and it is believed many were released into the sewer system where they have lived and bred living on rats and sewage. According to Rajendra Pachauri, the head of the IPCC, the growing threat to the millions of New Yorkers who live around exit and entry points to New York sewers is another example of the unexpected dangers which increasing Global Warming poses for the planet. Mr Pachauri added that the threat posed by the increase in numbers and mobility of the sewer alligators needs urgent scientific investigation before parts of New York become uninhabitable because of the danger. The IPCC chief said he has tasked the TERI foundation of India to immediately investigate and make recommendations. Mr Pachauri said the TERI foundation would be seeking funding to improve the understanding of how Global Warming threats can be communicated more effectively. “And it is also useful for raising funds for my TERI Foundation,” said a smiling Mr Pachauri.